This is a great activity to pair with the reading of Rainbow Fish Big Book or this cute fish story with beautiful illustrations and a fun rhyming story The Pout-Pout Fish . This is an easy fun craft to make as a culminating activity. The materials are simple but the end result is really pretty. Watercolor is a great media to use with young children. 1 Coloring Sheet printed on Cardstock or Water Color paper for best results. We googled free printable fish and used DTLK's Rainbow Fish template. Paint the fish with watercolors and let dry. For a thin layer of glue, brush Elmer's glue on a few scales. We used the water color brush to paint on the glue in small sections. Sprinkle glitter on the scales with glue. 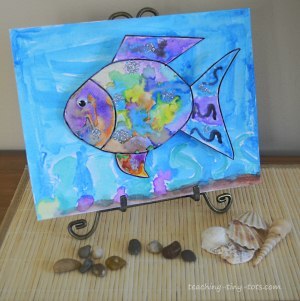 Paint the "ocean" on your cardstock or water color paper. For older children suggest painting sand, shells, and seaweed. Glue on wiggly eye on fish or paint an eye. For best results, use a glue stick to glue your fish on the ocean background. To create a 3-D effect cut a piece of paper about 1 inch x 2 inches and accordian fold. Attach to back of the fish and the paper. Let dry. Talk about colors you want to paint the fish. If you are doing rainbow fish look at a few pictures from the book and talk about the colors. Here are some fish books that would be a great way to introduce this activity or create a unit on fish or ocean. Most of you are familiar with the Rainbow Fish and other stories Rainbow Fish Finds His Way The original Rainbow Fish is about a beautiful, conceited fish lives in the ocean. His scales sparkle and shine as he swims through the ocean, but he is is very lonely. The other fish attempt to befriend him, but he ignores them until one day a small blue fish approaches him. The small blue fish compliments the Rainbow Fish about how beautiful his scales are, and asks for one of them. The Rainbow Fish refuses and swims on, puzzling aloud over his loneliness. A crab directs him to an octopus, whose advice is very simple, give away his scales to the other fish and he will be happy. After some thought, the Rainbow Fish decides to take the octopus's advice and finds friendship and happiness and gives the little blue fish one of his scales. Swim along with the The Pout-Pout Fish as he discovers that being glum and spreading dreary wearies isn't really his destiny. Bright ocean colors and playful rhyme come together in this fun fish story that will turn even the poutiest frowns upside down. Kids will love the repetition of the verses and enjoy the beautiful illustrations. This was read to our girls by the local librarian and it has been a favorite since.